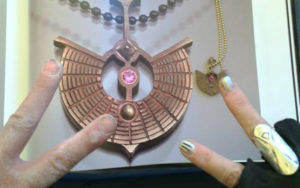 The photo above features my Nice peace sign with Kenn Kushner, THE maker of this AMAZING work. I’m among the dusty lucky, I come from a cohesive home camp at Burning Man called Bad Idea. We’re a camp nestled within Silicon Village (yes, its a take off on Silicon Valley Lots of Bay Burners makes for smart, creative, big brain big heart village). As for my Burning Man extracurriculars… I was a Fire Conclave Sentinel my first year 2013, performed in Fire Conclave in 2014 – the largest, most spectacular fire dance on earth. I’ve been a geodesic dome builder, a Travelling Maenad, Mirrora the fortune teller, a forest hanger (Sylvan Path art installation 2014) and thanks to Ladybee… I’m also a Jeweler of Burning Man. Thanks to her keen eye and friendly ways (she can spot a piece of Burning Man jewelry from halfway across Center Camp) I’m part of a group of jewelers who meet for a pot-luck on Playa to connect, chat, share stories, jewelry and inspiration. 2017 is the first year I’ve missed since 2013… and this year the potluck welcomed a special guest – Larry Harvey himself! Dusteratti! I sorry I missed meeting him but despite his dusty fame and the debt we all owe the man, I’d still rather shine the spotlight on Ladybee. Christine Kristen. Dusty icon. Life liver. People connector and jewelry curator in fact, she’s to thank for an amazing collection we can all view and enjoy. Thank you Ladybee. #FRIENDSPIRATION. Tag your friends with #friendspiration and #A_Nice_World on instagram and we’ll fling some winning boomerangs around to the besties of the besties like Ms. Ladybee. It’s a jeweler’s life moment. I’m beyond thrilled to be part of a show of Playa Made Jewelry (jewelry of Burning Man) and it’s thanks to the amazing Christine Kristen. Here’s a link to a piece she authored for the Burning Man Journal called Playa Made: Jewelry of Burning Man. Just when I thought I couldn’t be more lucky to ATTEND Burning Man, I end up meeting this inspiring woman. Thanks to her encouragement I’ve created a new Burning Man piece each year for the last four, and I have gifted a custom design to an extraordinary person at Burning Man each year. I couldn’t be more grateful. To see more, take a click and purchase the beautiful book with amazing photography and stories behind the work. Here’s the bio noted for my amazing friend who curated this amazing collection and made all this possible: Christine Kristen (aka Ladybee) was Burning Man’s art curator from 1999 to 2008, where she dealt with all things visual and aesthetic, including managing the art and the art grant program, photo-editing the Image Gallery, writing art content for the Burning Man website, working with the ARTery, managing the archives, and lecturing and writing about the art of Burning Man. She currently manages the art collection and works on the interactive environments around the Man- the Souk in 2014 and the Midway in 2015. She is the co-author of The Jewelry of Burning Man, with Karen Christians and George Post. She has an MFA in sculpture from the Art Institute of Chicago. I am so inspired by Burning Man and its gemlike cast of characters like Ladybee. Its an alternate universe but at the same time its something we can bring to everyday life and every interaction. Take a look at the Burning Man website and visit the gallery pages. Check out the Ten Principles. Be inspired and bring it to life around you every day.